The RBT builds upon the Rotabloc Energy Storage Unit to provide a simple UPS system that can be configured to provide the desired level of redundancy and resiliency for your facility. Efficient and sustainable, RBT can be used in low and medium voltage and, in either design, RBT delivers highly competitive CapEx and exceptionally low OpEx leading to an unmatched Total Cost of Ownership. 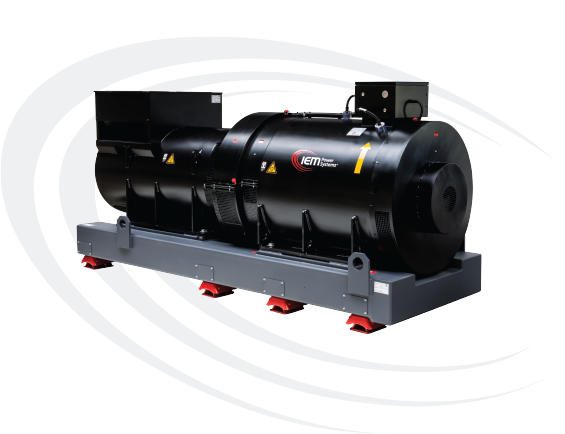 The system consists of a standard synchronous generator with no special windings and a simple steel flywheel. The low speed shaft extends bearing life and reduces maintenance. The ROTABLOC machine is very robust as critical functions do not use fragile components such as power electronics, power capacitors, electro-chemical batteries, active magnetic bearings, electro-mechanical or mechanical friction clutches. The RBT has been designed to be the central component in the power system of any facility that requires power protection and improved power quality - existing clients include: Data Centers, secure government facilities, research projects, banks, Air Traffic Control and manufacturing plants. The RBT utilizes the 'simply reliable' Rotabloc energy storage unit which is available in a wide variety of power ratings and adds power and control cabinets to create a relatively simple, and highly adaptable, UPS system. The RBT can be used singularly, but they are most commonly used in parallel to create redundancy and the resiliency required when running Critical loads that must never lose power during operations. RBT Systems can be used in conjunction with Low and Medium Voltage power systems and provide, along with the highest levels of reliability, a very sustainable UPS solution. Our highly efficient UPS supports your aims to minimize your environmental impact and mitigate the effects of rising energy costs in the future. Our ROTABLOC design, almost all steel and copper, ensures that it is over 99.97% recyclable. 91% of all voltage interruptions last less than 1 second (European urban locations) the RBT protects the load without generator starts*. *This is configurable to maximize RBT power output or compensate for short interruptions.